Hours after Apple announced a new OS X Mavericks build was available to AppleSeed members, the company released a Golden Master version of the next-generation operating system to developers. 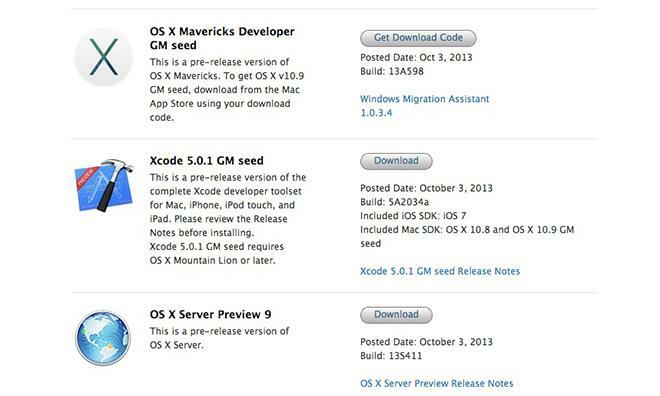 Two weeks after the last Mavericks Developer Preview was pushed out, Apple on Thursday made the OS X 10.9 GM available to developers. This is the final version that will ultimately be released to the public when Apple launches the OS in the coming weeks. Earlier in the day, the same build was seeded to AppleSeed members. Alongside the OS X GM, Apple also released the Golden Master of Xcode 5.0.1, which will likely debut alongside Mavericks. Apple is rumored to be planning a release for OS X 10.9 Mavericks sometime in October, though an official date has yet to be nailed down. When the new OS X finally hits Macs around the world, it will bring support for iBooks, new Finder Tabs, integrated Apple Maps, the power-saving App Nap function, and Compressed Memory, among other new features.